If you could put your ads in front of only those people who are most likely to buy your product or service, wouldn’t you want to do that? Targeted Digital Marketing uses the TARGETING of direct mail and the INTERACTIVITY of the internet in one COST EFFECTIVE and MEASURABLE solution to get your brand message directly in front of viewers. While all of the ad types we offer can be used with our Targeted Digital Marketing services, targeted video ads remain the most popular and provide the best metrics. Here’s why. Video consumption is changing. We used to watch TV at home with our families. Today we consume video everywhere we go on many different devices. TV ad buying used to mean buying ads to air on TV, today it means buying ads to air on TV, PC’s, tablets and smartphones in order to derive effective reach and frequency across multiple screens. In 2006 online videos began gaining real traction with viewers growing 73% in one year. Advertisers were primarily national or regional due to delivery limitations. By 2009 the late majority of online video viewers took hold and continued to grow by 20% in 2010. The ability to target video ads by smaller geographies was implemented allowing for more localized targeting. Today over 186 million people watch online videos every month for a total of 36 billion video views every month reaching 73% of the US online population. Targeting video ads by a person’s demographics and online behaviors is now available across most devices allowing for unmatched targeting abilities by almost any other medium. The number of US digital video viewers has risen by 19% between 2014 and 2017, reaching nearly 205 million viewers and continues to grow. Time spent on digital media increased by 83% in the past three years. The post-desktop era has begun. More than half of all digital media time is spent on mobile platforms such as tablets and smartphones. 186 million Americans watch 12.5 hours of online video every month. 63% of marketers increased brand advertising spend in 2013 but, 58% of online spending is direct response. Brand advertisers are turning to video for “brand impact” with “online efficiency”. On average, online video ad spend will increase 22.6% every year over the next five years with over 60% of the money coming from TV and digital display. Through consumer cookie targeting using dozens of data partners and our video ad network of over 80,000 websites and apps, we are able to put your fifteen or thirty second videos in front of highly responsive people in your marketing area. Video begins playing automatically with sound on when user chooses to watch a content driven video on premium leading websites and apps. :15 and :30 formats available. Achieve broad reach or target your audience effectively. Targetable geographically down to the zip code level. Targetable demographically and behaviorally down to the household level. 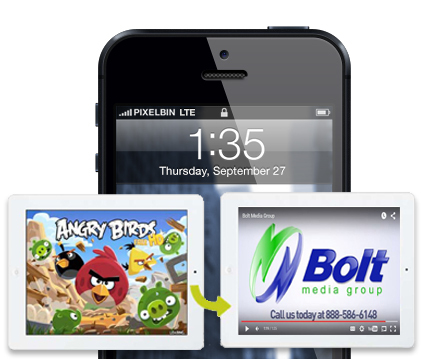 Can be served on PC’s, laptops, tablets and smartphones for complete cross-screen effectiveness. 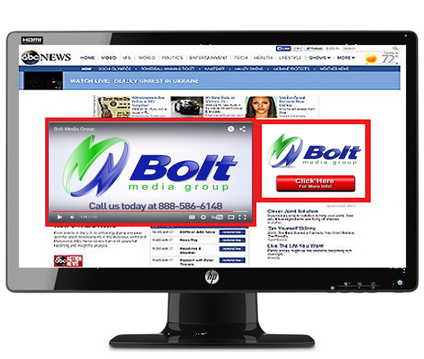 Complimentary companion banner ads available on 10-20% of all websites. Metrics such as views by site and ad, completion rates and click through rates allow for campaign optimization. Real time reach and frequency allows advertiser to know how effective their ads are being and adjust on the fly. The TARGETING of direct mail + the INTERACTIVITY of the internet. Now available to you in one COST EFFECTIVE and MEASURABLE brand message. class="page-template page-template-page-sections page-template-page-sections-php page page-id-63 samba_theme samba_left_nav samba_left_align samba_responsive wpb-js-composer js-comp-ver-4.12 vc_responsive"